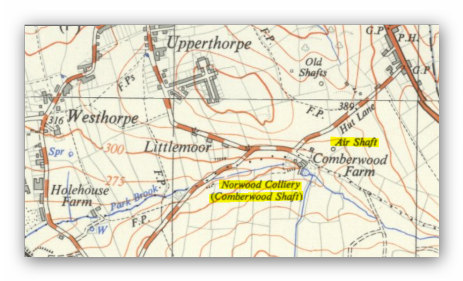 Norwood Comberwood Colliery Shaft. SK. 444797. SK. 446483 379711. This colliery was one of the first four sunk by the Sheepbridge company and was sunk to develop the lucrative Top Hard seam in 1865-1867. At one stage 56 horses were employed by the company at the colliery. By 1869 the colliery was producing 400 tons of coal per day and soon after twice that. 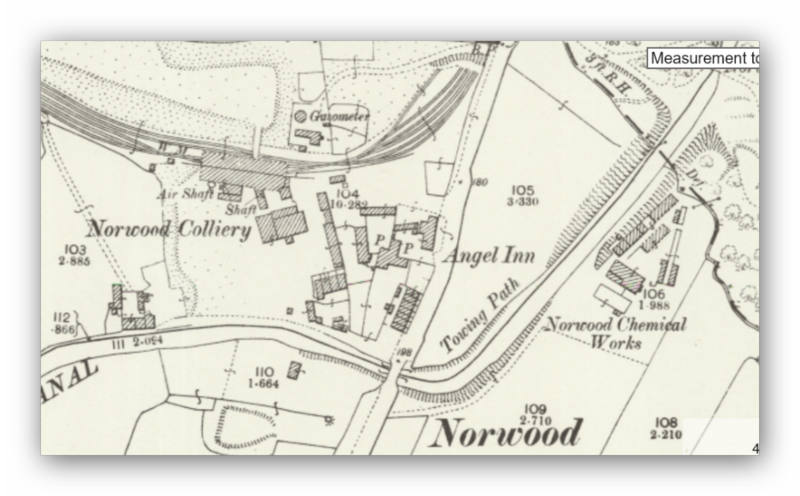 In 1872 it built a gas works at Norwood colliery to burn slack for power and lighting at the plant and for some of the local dwellings. By 1887 colliery losses of £14,474.1shilling. 11d. were announced, so in the 1880’s new leases were negotiated with the land owners for more coal reserves and the shafts were deepened to intersect these new seams. 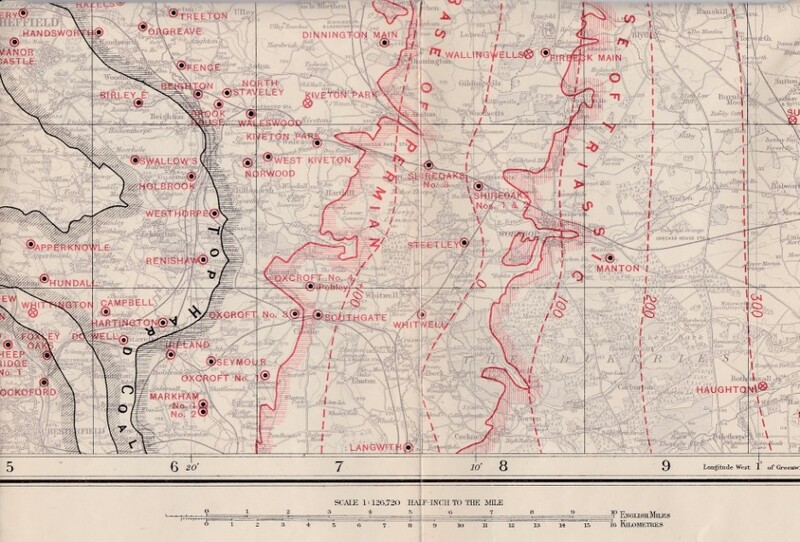 Norwood is closed in 1914 by the Sheepbridge Company with 390 men and boys redeployed. However the shafts were further deepened in 1916 as the colliery was reopened at some stage and worked the Deep Soft seam by new owners. J&G Wells Ltd., Eckington. 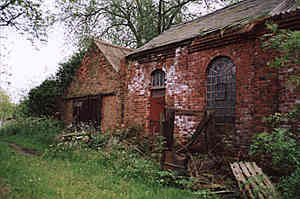 The colliery continues in use until at least 1945 as part of J&G Wells Ltd., Holbrook Colliery as Holbrook No.2. (Norwood). Possibly used for winding and ventilation purposes. Men of Iron. A history of the Sheepbridge Company. Mike Finney. ISBN. 0 9525678 0 6. William Granby labourer Killamarsh in the employ of the Sheepbridge Company working at Norwood colliery received injuries to his left forearm caused by a wheel of a wagon passing over it. It was found necessary to amputate the arm below the elbow. 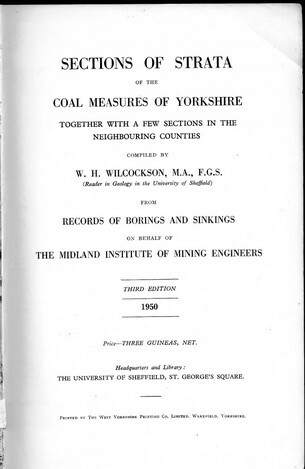 Sheepbridge Coal and Iron Co.
Norwood, Eckington, Sheepbridge Coal and Iron Co. Limited. Sheepbridge Coal and Iron Co., Chesterfield. Norwood. Killamarsh. W.L. Halpin Manager. H.C. Batty Undermanager. 359 Underground. 60 Surface. J&G Wells Ltd., Eckington, via Sheffield	Holbrook No.3	Eckington. Henry Burgin Manager. A. Preston Undermanager. 609 Underground. 191 Surface. Norwood No.2. Henry Burgin Manager. A. Preston Undermanager. 33 Underground. 7 Surface. Holbrook No.4. Henry Burgin Manager. G Sargeson Undermanager. 41 Underground. 7 Surface. J&G Wells Ltd., Eckington, Sheffield. Holbrook No.2 (Norwood). H. Kendall Manager. A. Preston Undermanager. 513 Underground. 193 Surface. Holbrook No.3	Eckington. H. Kendall Manager. Robt. H. Drury Undermanager. 154 Underground. 137 Surface. J&G Wells Ltd., Eckington, Sheffield. Holbrook No.2 (Norwood)	Eckington. E Thompson Manager. TOP HARD COAL AT 161 yards, 1 foot, 5 inches, FROM THE SURFACE. 4 foot 9 inches thick. (Old Shaft Bottom). DEEP SOFT COAL AT 352 yards, 1 foot, 4 inches, FROM THE SURFACE. 5 feet 2 inches thick. (New Shaft Bottom after deepening). Other seams at varying depths in between with an average seam section of around 2 feet. 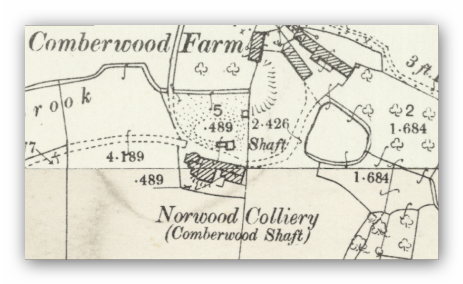 Photograph of Norwood Colliery Comberwood Shaft. Brian Crossland.